Chosen for its reliable quality and European compliance the Gang-Nail brand of punched metal plate connectors has been at the forefront of trussed rafter technology for over 50 years. 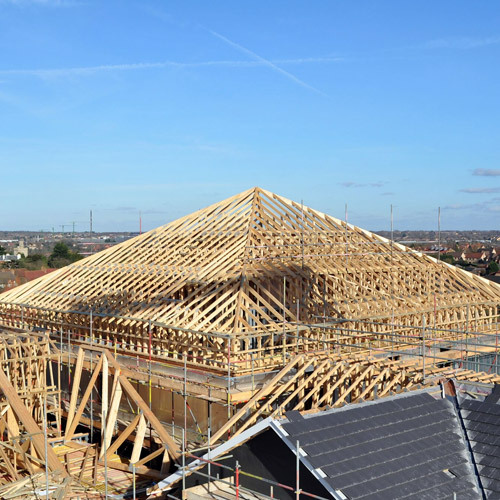 Gang-Nail is relied upon by a network of timber trussed rafter manufacturers throughout the UK and Eire. When used with ITW software, prefabricated trussed rafters are designed and supplied to the highest specification. Over the years the range and complexity of projects designed, supplied and erected by fabricator companies has progressed rapidly. Housing applications utlising prefabricated trusses are well known. The aesthetic and architectural appeal of pitched roofs has also spawned a rich variety of commercial and industrial applications including offices, shopping centres, superstores, hospitals, schools, hotels and light industrial buildings. Gang-Nail is an industry leading partner within the construction industry.